Here is a surprise for you. Hulk Hogan wants to wrestle again! Yes eight back surgeries later he is ready to test out those new rods in a TNA Wrestling ring. Not only that, Hogan has sights set on the TNA world championship! Hogan has been teasing this for some time yet nobody really believes it. I don’t know, maybe a recent lawsuit may have had something to do with that. The pro wrestling legend wants to test out all of his new body parts and make a run at the TNA championship. Yep, here we go again. Hogan made the statement on a recent edition of the Busted Open radio show. Hogan told the boys that not only is he interested in coming back, but he wants to be the oldest world champion ever. I am not sure what to think at this point. This would make sense of the entire Bully Ray angle, which at this point didn’t make a lot of sense. 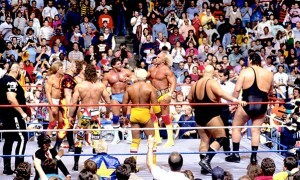 The whole angle appears positioned for a big clash between Hulk and Bully although nobody expects Hogan to wrestle. If Hogan really believes that he will be returning to the ring, than I don’t see any problem with his position in the angle. If not, it doesn’t make much sense. How big of a draw is Hulk Hogan in 2013? Quite frankly I think a return to the ring against Bully Ray could do well for TNA standards. The problem is that fans remember seeing Hogan attempt to work his way through a match with Sting. It wasn’t pretty. Fans will have to buy this event knowing they aren’t going to get much of a match. Unfortunately Hogan’s injuries have been so public that it is not a big secret that the man has health issues. Will it play into the final buyrate? I think it may a little but the nostalgia could really make it a big pay per view. But what about Hogan as world champion? It appeared that TNA was moving forward with their championship and putting it on some younger guys like Aries and Roode last year. Hogan winning would be a big backwards step for the title. My hunch is that the finish would turn into a deal with Hogan turning heel and getting help from Aces & Eights. Regardless, what does he do once he is champion? What happens if he isn’t healthy enough to do another match? 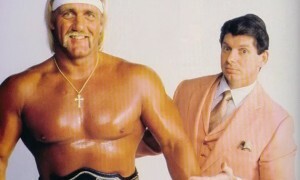 What does it say about the rest of the company when someone as old as Hogan is world champion? I wouldn’t worry too much about it. I’ll believe it when I see it.